Has the intervention of Pope Francis returned synod to heterodox trajectory? The Ordinary Synod on the Family moved much closer yesterday to a repudiation of the teachings of the Catholic Church on human sexuality. The hopes of faithful Catholics were raised on Monday by the reassertions of Catholic orthodoxy made in the relazione introduttiva of the General Relator of the Synod, Péter Cardinal Erdő, Archbishop of Esztergom-Budapest. Yesterday Erdő’s report and position were seriously undermined after an intervention of Pope Francis indicated to the synod fathers that the question of Holy Communion for the “divorced and remarried” was still open. Cardinal Erdő was also undermined by remarks made by synod fathers invited to a press conference organised by Holy See press spokesman Fr Lombardi S.J. In his opening report, delivered on Monday morning, Cardinal Erdő upheld Catholic doctrine across the whole spectrum of teachings pertaining to human sexuality. The General Relator decisively rejected the proposal of Cardinal Kasper on the admission to Holy Communion of those living in public adultery and clearly restated Catholic teaching on issues such homosexuality, the indissolubility of marriage and contraception. He also repudiated the false understanding of mercy that has been increasingly prevalent in the lead-up to the Ordinary Synod. “Mercy”, said the cardinal, “demands conversion.” A fuller analysis of Erdő’s report can be found here. Cardinal Erdő’s defence of Catholic teaching continued at the press conference held at the Holy See Press Office on Monday afternoon. The conference was also attended by Archbishop Bruno Forte, Special Secretary of the Synod, and by Cardinal Vingt-Trois, Archbishop of Paris. Cardinal Erdő was asked by journalists to comment on his report in connection with the reception of Holy Communion by the “divorced and remarried”. In response he defended his decision to uphold Catholic doctrine and stressed that, far from being unlimited, doctrinal development could only take place in accordance with Tradition. He also rejected the suggestion that there was an Eastern Orthodox alternative to Catholic doctrine and discipline by drawing attention to the divisions that exist within the Orthodox Church. Most pointed perhaps, was his remark that the Gospel reading on the day the synod opened was, coincidentally, Our Lord’s teaching on the indissolubility of marriage as recorded in St Luke’s Gospel. Archbishop Bruno Forte, who is known to have drafted heterodox passages on homosexuality in last year’s relatio post disceptationem, responded to Cardinal Erdő at the earliest opportunity. He ignored a question put to him by a journalist about large families and instead returned the discussion to Holy Communion for the “divorced and remarried”. Forte’s remarks fit the general narrative pursued by dissenting prelates at the Synod. Their modus operandi is to insist that the Church’s doctrine will remain untouched but that pastoral practice will change. In fact, the so-called pastoral changes that they propose, such as the readmission of unrepentant adulterers to Holy Communion, do in fact contradict Catholic doctrine. Pope Francis delivered an unscheduled intervention in the synod yesterday morning. He instructed synod fathers that they should consider the Ordinary Synod to be in perfect continuity with the Extraordinary Synod. He told them that they were to consider only three synodal documents as formal documents of the synod; these were his own opening address at the Extraordinary Synod, the Relatio Synodi of the Extraordinary Synod, and his own closing address of that synod. The heterodox nature of the Relatio Synodi, which received the Holy Father’s personal approval, was discussed by Voice of the Family in our Analysis of the Final Report of the Extraordinary Synod. The Holy Father also said that the question of the reception of Holy Communion by the “divorced and remarried” was not the only one for the Synod to consider. This would indicate however that Pope Francis considers the question to be open, despite being clearly resolved by Sacred Scripture, Sacred Tradition and the teaching of his predecessors. The content of the Holy Father’s intervention was repeated a number of times by Fr Lombardi and other speakers at the press conference. The intervention of the Holy Father yesterday has undermined the authority of Cardinal Erdő’s report and has signaled to the synod fathers that the Holy Father would prefer the discussions of the synod to proceed along the lines established by the heterodox Relatio Synodi rather than the orthodox introductory address of Cardinal Erdő. The Holy Father’s actions have gravely weakened the cardinal’s efforts to reorient the Ordinary Synod towards an affirmation and defence of Catholic doctrine. At a press conference held in the Holy See Press Office yesterday afternoon Archbishop Claudio Maria Celli, President of the Pontifical Council for Social Communications, was asked whether, following the report of Cardinal Erdő, the question of the reception of Holy Communion by the “divorced and remarried” was closed. By affirming that “the question is still open” Archbishop Celli not only undermined the witness of Cardinal Erdő but, much more seriously, repudiated the constant teaching of the magisterium of the Church. Yesterday’s press conference was also attended by Archbishop Paul-André Durocher, Archbishop of Gatineau (Canada). Durocher was asked by a journalist whether it could now be said that the issue of the reception of Holy Communion by the “divorced and remarried” should be considered a matter of “pastoral practice” rather than “doctrine”. Archbishop Durocher refused to take the opportunity offered to him to affirm the teaching of the Church; instead he simply stated that the synod fathers have different views on this point. At yesterday’s press conference Fr Thomas Rosica, English-speaking press spokesman for the Holy See, gave what he described as a summary of the interventions of the synod fathers. The interventions summarised by Rosica were almost uniformly “progressive”. One of the most disturbing aspects of Rosica’s summary was the suggestion that the question of Holy Communion for the “divorced and remarried” could be solved in different ways in different parts of the world. This would lead to different practices, and thus different doctrines, in different parts of the Church. Such division is, of course, inseparable from schism. The opening report of the General Relator, Cardinal Erdő, raised hopes that it might be possible for the Ordinary Synod to be reoriented in an orthodox direction despite the heterodox Instrumentum Laboris that serves as its agenda. 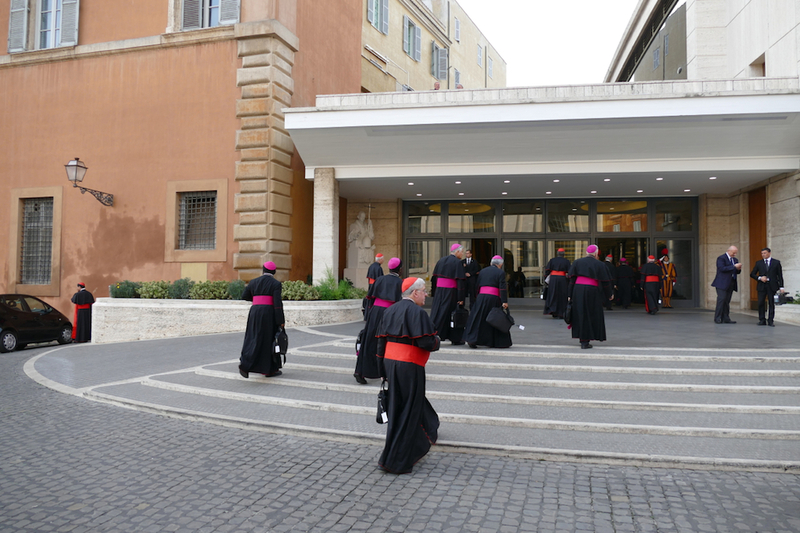 The undermining of Cardinal Erdő’s report by the intervention of Pope Francis seems to place the synod back on a heterodox orientation. If the Relatio Synodi and Instrumentum Laboris continue to be the basis for the Ordinary Synod’s work, then those responsible for the synod, and those who follow their lead, will remain on a trajectory towards formal repudiation of the doctrine of the Catholic Church.